Indulge me in a little impromptu Mudflats Theatre. Mom & Dad – Well-meaning, but indulgent. Unsure of how this whole family dynamic works. They appear weary and run down. Child – Cute as a button. Feisty, bold and confident. M&D – Child, we’ve got a problem here. Someone’s been stealing cookies from the cookie jar. We’ve done some checking, and due to the crumb trail leading to your room, the fact that nobody else was around, and the chocolate in the corners of your mouth, we’ve come to the studied conclusion that it was you. You know you weren’t supposed to be doing this. We haven’t decided what the consequences are going to be, but we are in complete agreement, and do believe you are the one who took the cookies. Do you have something to say? Child – I do have something to say to you, but you’re going to have to wait a minute. (wipes chocolate from corners of mouth and clears throat) I’ll be right back. (brightly) I’ve done nothing wrong and I can prove it! Friend – (nodding) She has done nothing wrong. M&D – (tentatively, to friend) But….what about all the evidence? Did you see the crumb trail? It’s not like we didn’t check this out ourselves. And she said she was going to prove she didn’t do it! Child – So, you’re saying you don’t trust me? (silence) What. Do you want to see what’s in my pockets? Is THAT what you’re saying? Because there are no cookies in there and I’ll show you to prove it. Do you want to know every single thing I told my friend to prove it? Is that what you want? That’s what you want, ISN’T IT?! M&D – (looking at the floor) Yes. We would like to see that. You promised you’d show us, so go ahead and empty the pockets, and tell us what you said to your friend. Child – This is rediculous. I can’t believe you won’t let this drop! You really don’t trust me….I can’t believe it. I mean I had my friend check this all out! You are just being unfair! Why do you hate me?!? (pause) You know what? Forget it. I’m NOT showing you what’s in my pocket because you are just being ridiculous! Dad, I know you’d agree with me if it wasn’t for Mom butting in! She just wants to ruin my life! We’ll I’m moving on. There are more important things going on in this house, like homework, and chores, and dinner! “The people of Alaska — and of the nation — deserve to have a decision from the proper tribunal putting their minds at ease that suggestions of misconduct that have circulated on the Internet and in some media outlets are not true. I therefore am waiving the confidentiality that usually covers personnel board complaints,” Palin said in a statement released by her lawyer, Thomas Van Flein, on Sept. 2, just days after she was named John McCain’s running mate. She gave her only testimony in the matter on Oct. 24 while on the vice presidential campaign trail. Van Flein said at the time that she wanted to release a transcript of her deposition. Reached Thursday evening, Van Flein said he hadn’t talked to Palin about releasing it since then. “That’s their call, I guess,” he said. Palin is simply ready to move on, her deputy press secretary, Sharon Leighow, wrote in an e-mail exchange this week. Sarah (child) who promised to release her sworn testimony (empty her pockets) which was given to Timothy Petumenos (friend), who performed the investigation of Sarah Palin, which she initiated herself, is now stomping out of the room. These are the kinds of parents that raise spoiled children with a sense of entitlement, who do whatever they want until someone stops them. I don’t want that kid running my state. This entire situation, of course, is dripping with irony, as GovernorPalin just returned from a trip stumping for Saxby Chambliss on the premise that if Democrats managed to get a 60-seat majority in the Senate, it would be a disaster because “we would have no checks and balances”. And she wouldn’t want HER kids growing up in a country like THAT. Indeed. Well, Alaska Legislature, I don’t want my children growing up in a country with no checks and balances either. Of course the Palin administration sees no purpose in finishing this process. Because the truth will hurt. Her testimony will open a big can of worms that we can all look at, and pick through, and figure out what she might have said that contradicts the truth. There’s a word for that……oh, yes! “Perjury.” Last time I checked, perjury was a crime. So, if she really really did nothing wrong, then why won’t she empty her pockets? I looked at the Anchorage Daily News today, and my first thought was, “Hey, isn’t that the lady from TV?” Yes, indeed, Governor Sarah Palin is back in Alaska and it looks like she’s working! After the national media descended on Alaska last summer, like ravens on a Wendy’s dumpster, many things were dragged out into the spotlight that otherwise might have lingered in Alaskan obscurity. I think of that bizarre phenomenon like a team of ten or twelve strangers coming into your house and emptying out your closets, taking inventory, and then writing about it. You’d realize that maybe you had some strange stuff in there, that you had just gotten used to, and other stuff you didn’t even know was in there…but now that you look at it all in the light of day, through someone else’s eyes, you realize that maybe you should have been cleaning out your closets more often. One of those things was the Palin administration’s record on health care for children and pregnant women. The national media was not kind in its analysis of how Palin was caring for women and children, and many Alaskans had been furious about it for some time, and felt vindicated by the media analysis from outside the state. Lawmakers have scrapped for years over Denali KidCare, which provides health insurance for lower income children and pregnant women. Palin last year opposed the push to increase coverage — even though the state was enjoying a huge surplus at the time from high oil prices. It’s one of dozens of policy calls that came under scrutiny as the governor became a national figure in the wake of her nomination this summer for vice president. Palin, pressed on why she’s now changed her position, kept repeating that it is an opportunity for more children to be covered. And, as usual, nobody is happy. Democrats think she hasn’t gone far enough, and Republicans think she’s gone too far. But Republicans will likely not stop it, and Democrats will take what they can get. One of the good things that has come from Palin’s run for VP, is that Alaskans have been forced to look outside the bubble. Those who have felt that Palin’s policies and attitudes were not in alignment with their own, are now realizing that a lot of other Americans out there share their sentiments. It’s hard sometimes to remember that out there is a big wide world that isn’t Alaskan. Palin will release the rest of her proposed state budget next week and said not to expect any significant cuts. She downplayed the danger falling oil prices pose to the state budget, saying Alaska is in a far better position than other states. Palin claimed the state could still end up with a surplus even if oil averages $45 a barrel over the next several months. David Teal, the state Legislature’s chief budget analyst, said that is possible for the current fiscal year that ends in June. But he has doubts. “Oil is falling pretty fast; we don’t know if we’re going to have a surplus or a deficit,” Teal said in an interview. Palin’s new spending plan, though, would start in the next fiscal year — when Alaska oil prices would have to average at least $20 a barrel more than now to balance the budget. Welcome to the season of tight-rope walking, fiscal wrangling and hand-wringing as we try to pack all that stuff back in the closet. Oh, but it’s true. Our gun-totin’ “Gover-Girl” has her very own 2009 calendar. Soon to be gracing garage walls all over the Mat-Su Valley, and the southeastern United States…..(drumroll please)…..
Sarah Palin went from virtual obscurity to huge popularity as Presidential Candidate John McCain’s running mate. Since then she has re-energized the Conservative base of the Republican Party. As a front runner in the 2012 Republican Presidential nomination, she is showing America that she is willing to reform her own party and politics as usual. Now you can have your very own 2009 calendar featuring never before seen photos of Sarah, with Todd, Track, Bristol, Willow, Piper and Trig Palin. Filled with exclusive photographs by professional photographer Judy Patrick, long time friend, who also served as Palin’s Deputy Mayor of Wasilla, Alaska. Why is it not surprising that the woman who is doing the calendar is not only a long-time friend, but that she’s a long-time friend who was ALSO her deputy mayor?? It’s like a double-scoop of croneyism. I have to confess, that while I was expecting a calendar of this sort to emerge eventually, I was also expecting one of those calendars like the “Bushism-A-Day” ones. Surely there are enough Palinisms to have a 13-month calendar! The Gibson and Couric interviews alone are good for a calendar each. While we wait, Amazon features four Barack Obama wall calendars, but alas no Joe Biden. Maybe for 2010. Walt Monegan - Photo by Linda Kellen Biegel. Has Christmas come a little early here in the North Land? I almost fell off my chair yesterday when the latest rumors broke. I was unable to attend a talk given by former Public Safety Commissioner Walt Monegan, but two of Alaska’s intrepid bloggers were there and they have some interesting news. 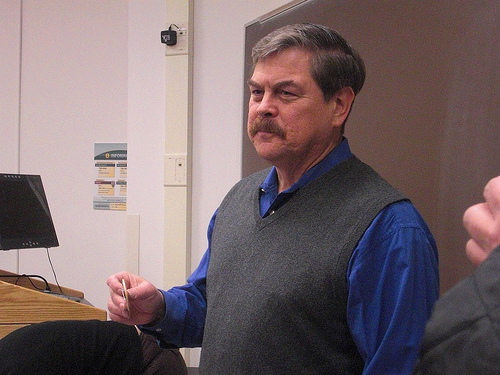 Former Anchorage Police Chief and Alaska Public Safety Commissioner, Walt Monegan, speaking to a group of journalism students, UAA faculty, and community members, refused, when asked whether he might consider running for governor of Alaska, to rule it out. When asked a third time about this, he stated that he had agreed with his faculty host, not to discuss his political future at the event. I attended the talk to meet Monegan, a public safety officer I’ve long respected. There were a couple of questions I had hoped to ask, but they weren’t about his political aspirations. The questions on future politics and potential political considerations he might be pondering, took me completely by surprise. As long as it’s not violating any rules I could honestly say that my wife and I are talking about it. And a hush falls on the land. What’s this? Did someone actually address the importance of the integrity of our government and its leaders and MEAN it? Ears prick up everywhere. I’d recommend reading both posts in their entirety, and also check out the link to the audio of Monegan’s talk on Blue Oasis. 2010 could be very very interesting. I wonder what’s being chatted about at the Governor’s office today? I’m sensing another chapter in the Greek myth that is Alaska politics. OK, Mr. Monegan, you take the left flank, and Senator Murkowski, you take the right flank and Alaskans for Truth will head right up the middle. Someone blow a horn! Sarah...er...I mean Lila with a 2010 campaign sign! Sarah Palin isn’t the only Alaska politician with national appeal! This is Lila from the Mudstock meetup in Chicago in October. It’s true…Mudflatters can see the future! Where’s Sarah? The Return of a Classic. 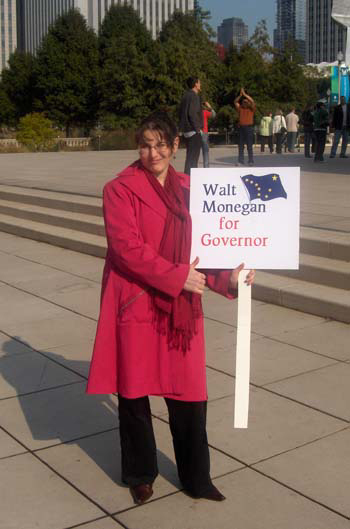 Back in 2006, the members of the Alaska State Legislature were doing their jobs in the place they were supposed to be doing their jobs, also known as the state capitol, Juneau. The governor, however, didn’t like Juneau much. She preferred to do her job from Wasilla and Anchorage, while collecting per diem payments and living in her own home. I know that the rest of the Legislature who live in the Anchorage area would probably love to do their jobs from home while collecting per diem payments. It’s hard to be away from your family for that long. Juneau can only be reached by plane. It can be difficult. But I’m guessing it would be frowned upon if they did it. Double-standard aside, Sarah Palin was absent from her place of employment a lot. As a sign of protest, legislators from both sides of the aisle took to wearing a unique fashion accessory. They appeared at the Legislative session wearing buttons that said, “Where’s Sarah?” They realized that it was, in fact, impossible to be effective as a governor if you are not actually present. This astute political observation couldn’t be more relevant today. Today, Sarah Palin is not in her office. She is not dealing with the affairs of state. She is not working on the gas pipeline, or the dropout rate, or trying to figure out why our gas prices are more expensive than anywhere else in the country. She’s not playing catch-up from all the work she missed while on the campaign trail, and she’s not trying to figure out what to do to keep Alaskans warm this winter. She’s not figuring out what to do about the budget which was finalized when oil was in the $60/barrel range, not the $45/barrel it is now. Anchorage – While Gov. Sarah Palin is out of state again, this time in Georgia campaigning for incumbent Republican U.S. Sen. Saxby Chambliss on the eve of the runoff election, Alaska faces challenges including a lack of leadership from the Governor. Oil prices have dropped dramatically to about $45/bbl from the peak of $144/bbl in July, which threatens the state budget. Alaskans are paying some of the highest prices for gas in the nation, averaging $2.87 per gallon, while the national average is $1.91. The state’s oil production continues to decline, due to falling prices and mature fields. The global credit crunch and falling natural gas prices threaten the Alaska gas line. The State is failing to meet its constitutional obligation to take care of public education as shown by the high drop out rates and the low graduation rates. Many Medicare patients cannot find doctors. There is continued flight from rural villages. Alaska faces the prospect of reduced federal dollars from Washington, D.C.
Why the press conference? Is this one-day stump that egregious? Isn’t she going to be on the east coast anyway to join other governors as they meet with President Elect Obama on Tuesday? What’s the big deal? I’ll answer that question as my mother would. “Sarah, you’re really pushing it.” And she is. And each time she pushes, more and more Alaskans will push back, and her popularity will continue to slide, and she will continue to play “gotcha” with herself. 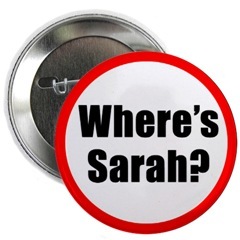 In honor of the governor’s flight to Georgia, I have resurrected the “Where’s Sarah?” button. I have tried in vain to find an image of the original button, but have hopefully captured the spirit in this new incarnation of an old favorite. To get one, or several dozen, click HERE. And don’t worry Legislators, my customer list is strictly confidential…your secret is safe with me! 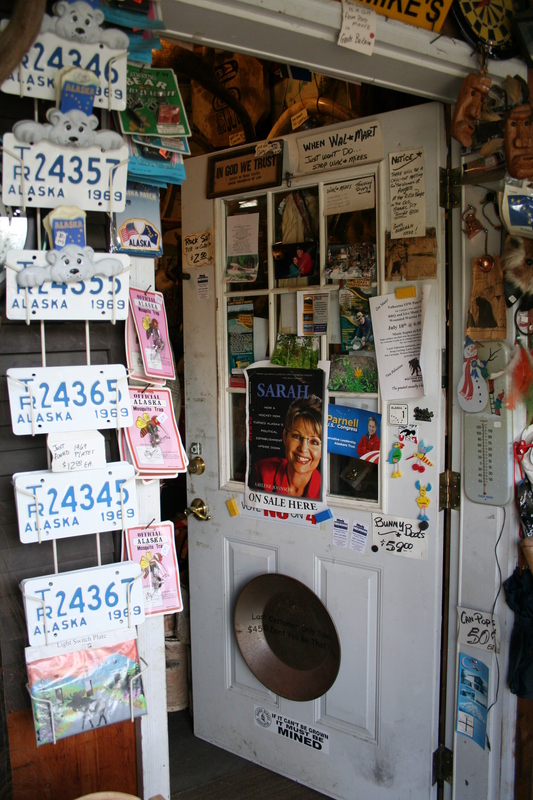 Tags: Alaska Democrats, Alaska energy prices, Alaska gas prices, Alaska legislature, Alaska rural issues, Alaska schools, Palin blackberry, Palin Chambliss, Palin out of Alaska, Palin per diem, Palin travel, Patti Higgins, Sarah Palin, Where's Sarah button, Where's Sarah? Readers Who Purchased Sarah Palin’s Biography Might Also Like….WHAT?! Oh, those crazy conservatives at Human Events….they do make me laugh! Most of the time they make me cringe, and occasionally they make me nauseous, but somehow they manage to toss me little crumbs that make it all worth while. Today, I received my daily email from the dark side, and in it, the offer of “Sarah Palin’s New Book” for free! Of course, the book isn’t by Sarah Palin as the subject line might imply. And it isn’t new as the subject line might also imply. This book has been around for at least a year, and I’ve seen it sitting in stacks on the book table at Costco. Now, the major media is in full overdrive to smear and rewrite the accomplishments of this courageous young woman and rising Republican star. But who is the real Sarah Palin? She is more than a former beauty queen, conservative politician, family advocate, hockey mom with “lipstick” and moose-hunting NRA lifetime member. She is a true reformer who took on the political and business establishment in Alaska and won. And she may make history as the first female vice president of the United States. (screechy brake noise) She MAY make history as the first female vice president? Yes, I received this email on November 30th, which means that Human Events doesn’t actually update, or proofread their emails before sending them. It’s the “Just use that one again” strategy. In Sarah, the first biography of Palin, author Kaylene Johnson draws upon personal interviews with Palin herself, her family, and closely placed sources to explore her private and public life. Sarah also includes 16 pages of Sarah Palin’s most personal photos! (screechy brake noise) MOST personal photos? Couldn’t we just have the regular personal photos? What makes these the MOST personal?? I solemnly take a vow that the next time I am in Costco, I will take a big deep breath and look at Sarah Palin’s most personal photos, and report back. HUH?? No, I am not making this up. Terror Occulta….truly. This is the book, of all books, that Amazon has chosen to pair with Sarah Palin’s Biography. Wow. 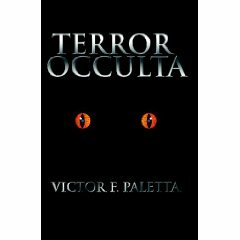 In a classic tale of good and evil, in Terror Occulta, author Victor F. Paletta goes to an eerie and wicked place that is wholly unusual and utterly fascinating. His is a distant future where life on earth has taken a turn for the worst. An enemy that once hid from a more technologically advanced people turns the tide, and is now on a relentless hunt for humans. Could this “distant future” be…(insert creepy organ chord here)….2012??? Joe the Plumber Won’t Go Away Either. The two people that most of America was hoping would become footnotes in history, or questions in Trivial Pursuit after Election Day, continue to prove that they will not go gently into that good night. And now….he’s baaa-aaack! I speak of Joe the Plumber. I picture him and Sarah Palin as a set of bookends that John McCain used to try to prop up his flagging campaign, and they were the cheap kind of bookends that aren’t very heavy and don’t have that little thing that you slip under the books to hold them up. In other words, they were for show, and they didn’t work for squat. Nevertheless, they continue to sit there on the shelf and annoy us, and we have to keep looking at them. The commentary from Cenk Uygur makes this one bearable. I wonder if Joe will show up in Georgia on Monday? It actually wouldn’t surprise me.